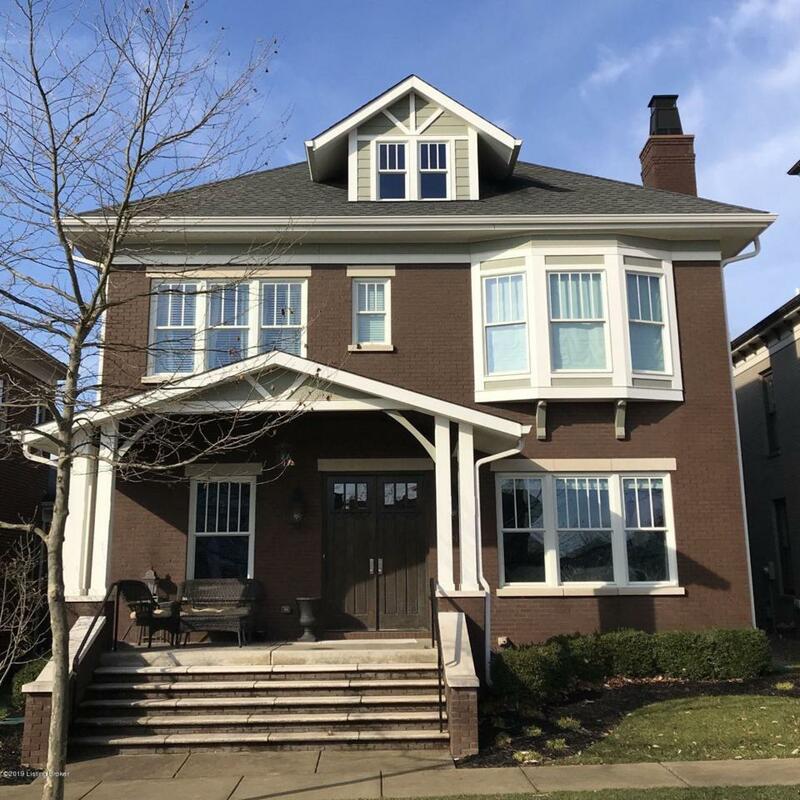 This former Homerama home overlooks vast green spaces, perfectly located between the downtown shops and oval park in Norton Commons. An easy walk to dinner or to a concert at the Amphitheater, this is the perfect home to enjoy everything this neighborhood has to offer. An all brick home in the timeless Craftsman style, the beautiful details are noticed from the second you step on the covered front porch (shaded in the afternoon and evenings). The first level is an open floor plan and includes a formal great room with coffered ceilings, wainscotting and built-ins around the first fireplace. A study with extensive wood trim and coffered ceilings adjoins the entry with glass french doors and boasts a view of the front porch and green space. The kitchen is made for gathering around the largeisland. Kitchen is complete with custom cabinetry, marble counter tops, Jenn-Air appliances, leaded glass built-ins and a large walk-in pantry. A hearth room with a second fireplace and a dining area overlooking the back patio remain open to the kitchen. Just beyond the dining area lies a half bathroom, built-in cubbies, a planning area with desk and large coat closet and entry to the attached garage. The second level features the large master suite with a tall, ornate ceiling and window seat over looking the Meeting Street green space and fountain. The spa-quality bathroom hosts a corner walk-in shower, large soaking tub, double vanity with marble counter tops, and private toilet closet. The master closet sits off the bathroom and was designed with "his" and "her" sides. Three additional bedrooms with walk-in closets, two full baths and a laundry room complete the second level of this home. Two bedrooms share a Jack and Jill bath, each with separate vanities. The fourth bedroom has an ensuite bath and a view of the greenspace. This home's finished lower level has a beautiful custom bar, complete with sink, beverage fridge and dishwasher. A brick and wood tray ceiling connect the bar and living area, perfect for entertaining. A lower level guest bedroom with egress window and full bath make it the perfect accommodations for visitors. Completing the lower level is a large finished playroom and 350+/- sqft of unfinished storage space. A bonus to this beautiful home is a deep three car attached garage with 12 ft ceilings. Call today to tour or get more information about this perfectly located home in Norton Commons!